Newly formed in the Fall of 2017, The Asrai String Quartet – Rabia Brooke (16), Eva Nicholson (16), Margaret O’Malley (17), and Camille Toubol (15). The Quartet is comprised of some of Chicago’s top young Prize Winners. 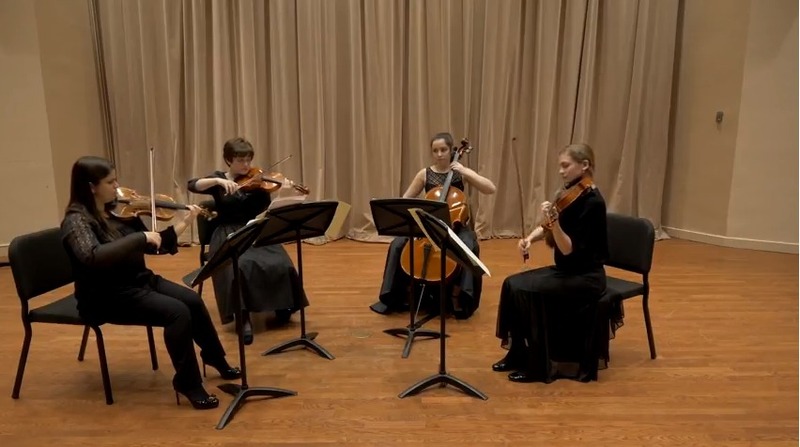 The quartet members have received awards in Society of American Musicians, Chinese Fine Arts Society, De Paul, Curtis Institute of Music, Barnett, Discover, Fischoff Chamber Competitions among others. Their individual performances include appearances throughout Chicago including Chicago Cultural Center, Ganz Hall, as well as Symphony Center as members of the Chicago Youth Symphony where they have toured Europe in the Summer of 2016. They have participated in Festivals throughout the world including Meadowmount, Curtis Summerfest, and Musique Dans Le Gers in France. Passionate about contemporary Music, the Asrai Quartet will be playing and working with award winning local composer, Stacy Garrop. They are coached by Desirée Ruhstrat of the GRAMMY-nominated Lincoln Trio. Bedrich Smetana Quartet No. 1 in E minor, "From My Life"